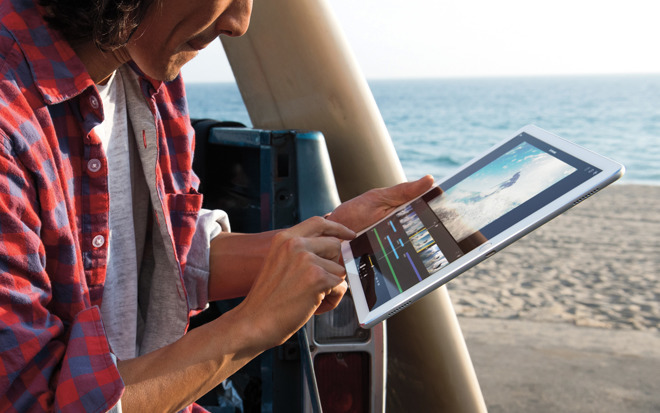 Apple could be preparing to announce or launch new iPads on Apr. 4, shipping delays for the 12.9-inch iPad Pro suggest, though Apple is unlikely to hold a launch event at Apple Park's Steve Jobs Theater as speculated by one website. U.S. shipping times for the 12.9-inch Pro are now at a widespread 2 to 3 weeks, Apple World Today noted on Tuesday. More significantly in-store pickup dates have been set for Apr. 4 if a particular model isn't already in stock, a timeline verified by AppleInsider. In recent weeks Apple has been rumored to be planning a March press event with three new iPads, including an updated 12.9-inch variant and a completely new 10.5-inch model. The 9.7-inch format may become Apple's new "budget" option. Many existing 12.9-inch models are out of stock or on back-order. It is possible that Apple will hold an event later this month and ship in April, or perhaps hold an event on Apr. 4, launching new iPads the same day. Apple is unlikely to hold any showcase at Apple Park, as rumored by AWT. While the company's new headquarters will open to staff next month, the Steve Jobs Theater is due to open later in 2017. Apple could conceivably hold a makeshift event at Apple Park, but more likely is a keynote event at its existing 1 Infinite Loop campus or a San Francisco venue like the Yerba Buena Center for the Arts. Details on the new iPads remain elusive, but it's possible that the 10.5-inch model will minimize or eliminate bezels, enabling a large display without a bigger chassis.